Despite walking 12-15 miles per day, I have never lost weight while doing a Camino. Dinner last night at the Gite d’Étape LaGrange will help you understand why. Oh — and that dinner? Well, I’m in France. Take a guess as to how amazing it is. But for those of you who have not yet had the pleasure of eating in France, I’ll elaborate. And those of you that have had a meal in France, well, I’m sure your mouth is watering already. 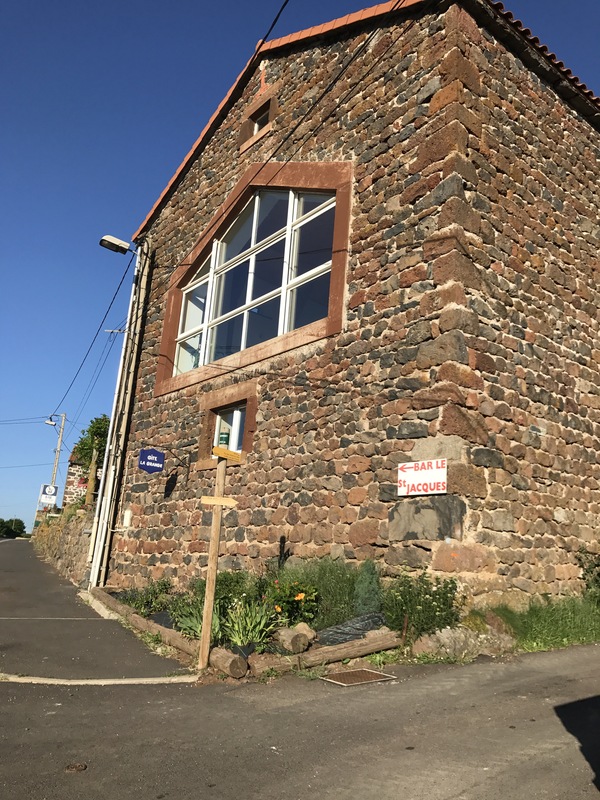 At seven p.m. the ten of us staying in the gite gathered around the table, which was set and already had bottles of wine and pitchers of water as well. Our host, Christian, deposited two bowls on our table. The first was a salad of mostly tomatoes and hard-boiled eggs as well as some lettuce, all dressed in the mustard vinaigrette that seems to be traditional (as I’ve had it all over France and in Switzerland as well). The second bowl contained the famous Le Puy green lentils, cooked in some sort of vinaigrette as well, from what I could tell. “Oh, no,” he assured me. I could have left the table satiated at that moment, but having walked 10 miles, I didn’t think I’d have trouble eating something else. For our main course, Christian served us thick links of baked sausages (another regional speciality) and the creamiest mashed potatoes I’ve ever had. I can assure you his wife Françoise (who does the cooking) didn’t use skim milk to make them. On the Camino in Spain, when a meal includes dessert, dessert is a piece of fruit or a small cup of plain yogurt accompanied by a packet of sugar. Certainly not what we Americans would consider dessert. So you can understand why I thought the cheese was our dessert. “Nope,” Ed said. “That was just the cheese course.” Well, duh. Of course the French would have a separate course during which the only goal is to enjoy some of the country’s cheeses. So just when I thought things couldn’t get any better, Christian, for his final performance, brought out slices of chocolate cake. And of course it was unlike anything I’d had in the U.S. It wasn’t nearly as sweet. You could actually taste the chocolate as opposed to the sugar. And so it was that two hours after we started, the ten of us cleared the table for our host. Yes, we were paying for the meal and for his service, but when you have a meal like that money just doesn’t seem enough. So don’t worry about me. I’m doing quite well here in France. Perfectly content to not lose a single pound this entire trip.